A traveling carnival with a live tiger joins the parishioner’s harvest fair at The First Church of the Evening Star and Everlasting Light. Accused again when counterfeit bills are discovered at the carnival, and when the war bond money goes missing, Agnes sets out to restore her reputation and locate the money. Her attempts lead her into harm's way when she discovers a friend's betrayal and even more about carnival life than she bargained for. Granddaughter Katherine's turbulent love triangle with a doctor and an FBI agent rivals Agnes’s own on-again, off-again relationship with Godfrey. Mrs. Odboddy is once again at her quirky best and following her own version of Murphy's Law. She's consistently at the right place at the wrong time, and it is not surprising she's the common denominator. Not enough evidence for an arrest but in a small town... Godfrey's return seems to be the bright spot and she is able to help with the war bond effort, and may just be cleared of the counterfeiting, until the old trench coat is donated and she tries to find it. This is a fun read with some surprises and unanswered questions - at least for Mrs. Odbuddy. The tiger is an added touch. So far, this is my favorite in the series, and it can be read as a stand-alone mystery. 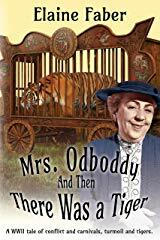 If you haven't read the others though, you should get to know Mrs. Odboddy and Godfrey's stories first.